Anne Close Springs Greenway Engagement. Caitlin and Eric chose the Anne Close Springs Greenway in Fort Mill, S.C., as the idyllic spot for their engagement session. Embracing fall and its array of colors, this couple channeled the season's vibe through cool clothes, cool smiles and a pretty cool truck. With golden leaves all around, Caitlin and Eric shine in the middle of the greenway. Their fall fashion is on point with her cranberry sweater, and his puffy vest and flannel shirt. The photographer captured many up-close shots of the couple standing under the greenway’s beautiful fall-flushed trees. Caitlin and Eric even grab a blanket and snuggle on the ground before making their way around the park. The greenway features numerous event spaces, and Caitlin and Eric find their way to one of its historic cabins, where they look right at home. They hold hands on the porch as their smiles shine right through their eyes. Eric really wanted to get photos with his truck, so the photographer happily obliged. With a blanket laid down on the tailgate, the couple have a chance to kick back and relax. Caitlin looks stylish in an off-the-shoulder dress and tall boots, while Eric coordinates with a wool coat. They waste no time getting close and comfortable, cuddling up in the cool fall air as they take in the beauty of the greenway - and each other. 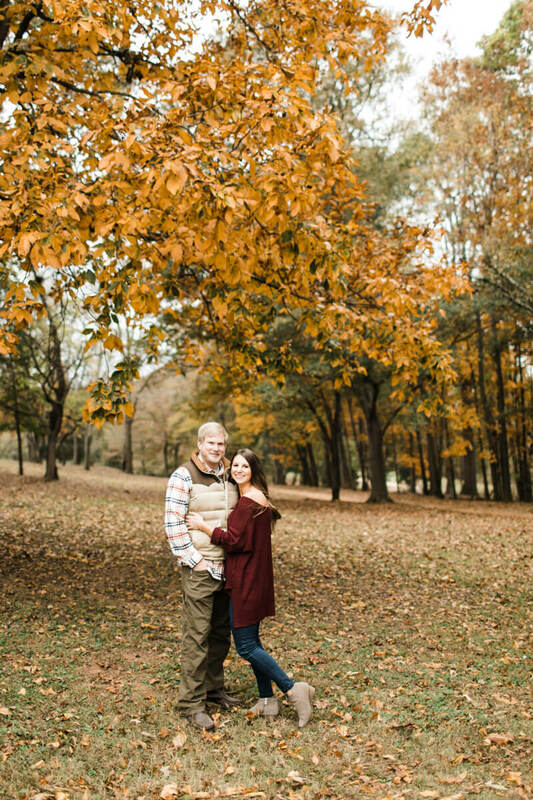 There was no better location for Caitlin and Eric’s fall-themed engagement session. The greenway provided all the rich color and solitude one can hope for on a perfect autumn day. While this experience allowed them to explore and embrace their favorite season, they were also commemorating a new season of life.